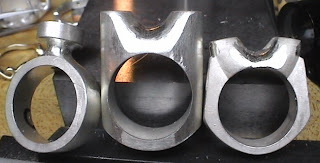 I thought I would post these photos of a ring I made in 2002 or 2003. 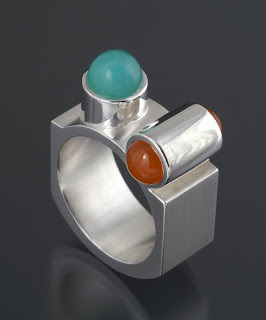 I just photographed this ring a couple weeks ago to enter in Lark Books 500 Gem and Stone Jewels book. 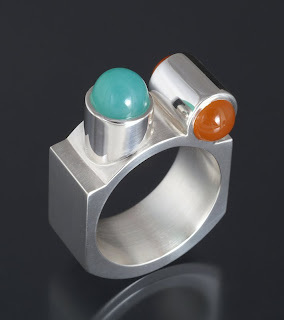 It is cast silver, the green stone is chrysoprase, the orange stones are carnelian. This ring is pretty typical of a lot of the designs I was working on when I lived in San Diego (1999-2004). 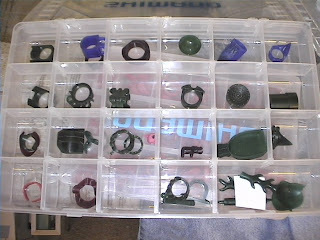 I used to carve a lot of wax, mostly rings. 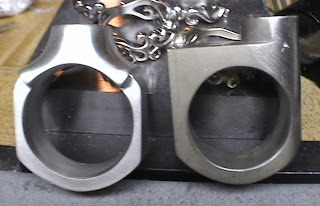 Eventually I got sick of these kinds of rings because they have straight sides and can't be sized without changing the shape of them. 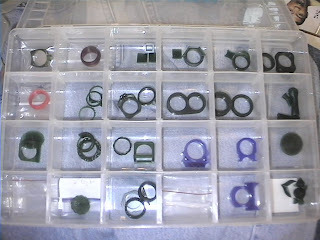 More rings I was working on 2003. I think 2 of these are sitting in a box still unfinished. I used to love carving wax. One of the other reasons I carved wax was because I didn't have a lot of tools and you don't need much to carve wax. I was also living in an apartment, so I couldn't make a lot of noise. 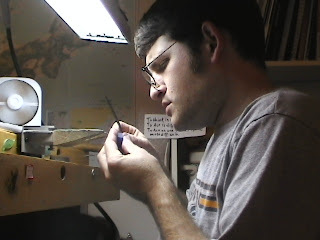 When I moved to Iowa to go to grad school in 2005 I pretty much totally stopped carving wax because I had access to a large studio and wanted to take advantage of it. Carving a wax in my apartment in Oceanside, CA. Sept 2003. What I have been doing lately. I also made some Christmas presents. 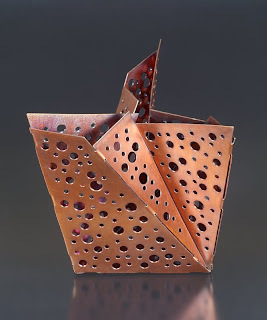 And a folded vessel. 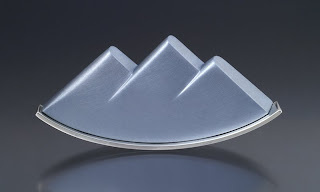 Almost like the titanium one in 500 Metal Vessels. I found an old paper model, and I thought it was the same as the titanium one, but it wasn't, this one has slightly different proportions. I didnt know it till I was finishing it. 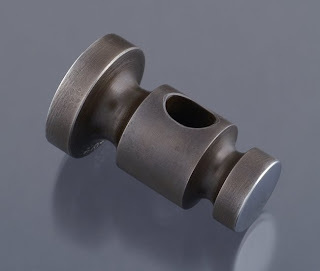 This one is much more closed than the titanium one.